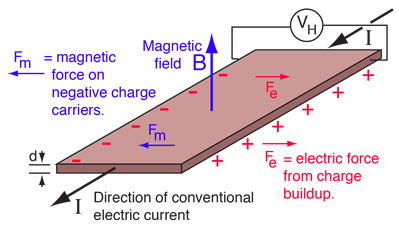 This is the conventional Hall effect, however, there are other existing Hall effects, observed in different systems: the anomalous Hall effect, the quantum Hall effect, the spin Hall effect and the topological Hall effect, to name a few. In this study, they observed the Hall effect due to the topology of the spin texture (topological Hall effect). When electrons travel across nontrivial spin distributions, they feel an effective emergent magnetic field (which is perpendicular to the direction of the current) due to the Berry phase acquired by electrons. Therefore, it is a phenomenon that does not occur for any spin distribution, but requires a specific topology. This emergent magnetic field gives rise to a transverse voltage (like in the conventional Hall effect), which could be used in potential applications, since these spin distributions are protected by their topology and are more robust against fluctuations and noise. This work is important because the observed topological Hall effect is unusually large (giant! ), and because this Hall effect is strongly dependent on carrier concentration in the material, which can be used to control it using electric fields, opening new prospects for potential applications. The contribution of the ICMAB researchers has been in using magneto-optics to measure the topological Hall effect produced due to the geometric distribution of the spins. Giant topological Hall effect in correlated oxide thin films. Lorenzo Vistoli, Wenbo Wang, Anke Sander, Qiuxiang Zhu, Blai Casals, Rafael Cichelero, Agnès Barthélémy, Stéphane Fusil, Gervasi Herranz, Sergio Valencia, Radu Abrudan, Eugen Weschke, Kazuki Nakazawa, Hiroshi Kohno, Jacobo Santamaria, Weida Wu, Vincent Garcia and Manuel Bibes. Nature Physics (2018) Letter | Published: 15 October 2018. DOI: 10.1038/s41567-018-0307-5.